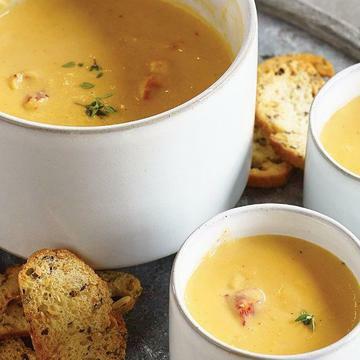 Our thick, creamy bisque is created from pureed North Atlantic lobster and cream, and then accented with juicy morsels of lobster and a perfect blend of seasonings that is nothing short of sublime. Simply heat, serve and savor the gourmet flavor. Do Not Thaw!�Stove-top: Bring enough water to a boil in a pot to submerge soup bag. Place bag of soup in water. Reduce heat to medium and let simmer 30 minutes. Remove bag with tongs and carefully cut open corner using scissors. Pour into serving bowl and serve.�Microwave: Place unopened bag in microwave. Microwave on defrost for 6-8 minutes. Carefully cut open corner of bag and pour into a microwave safe dish. Microwave on high for 5 minutes or until internal temperature reaches 165�F. Stir well before serving. Ingredients: Cream, Milk, Water, Lobster Meat, (Lobster, Salt), Flour (Enriched Wheat Flour, Niacin, Reduced Iron, Thiamine, Mononitrate, Riboflavin, Folic Acid, Malted Barley Flour), Butter (Cream, Salt), Sherry Wine (Wine, Salt, Naturally Occuring Sulfites), Tomato Paste (Tomato Paste, Salt, Citric Acid), Onion, Celery, Lobster Base (Cooked Lobster Meat, Salt, Organic Evaporated Cane Juice, Tomato Paste, Butter (Pasteurized Cream, Salt), Dried Whey (Milk), Natural Flavoring, Codfish, Tomato, Powder), Modified Corn Starch, Salt, Paprika, Spices, Garlic. Contains: Shellfish, Milk, Wheat.